Do you have a set of our dining room chairs? Maybe a child’s table and chair set? Well, what better way to let the kids feel all grown up than to get them a matching rocking chair? 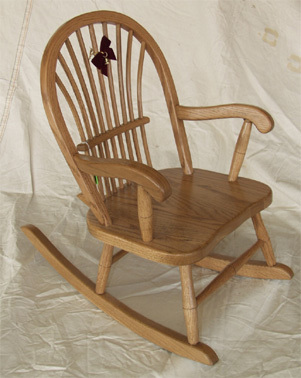 Built tough enough for an adult, but in just the right size for a child, this rocker is the perfect addition to your furniture collection. Shown here with a wheat back style - ask us about the availability of other back styles if you need to match your existing chairs.